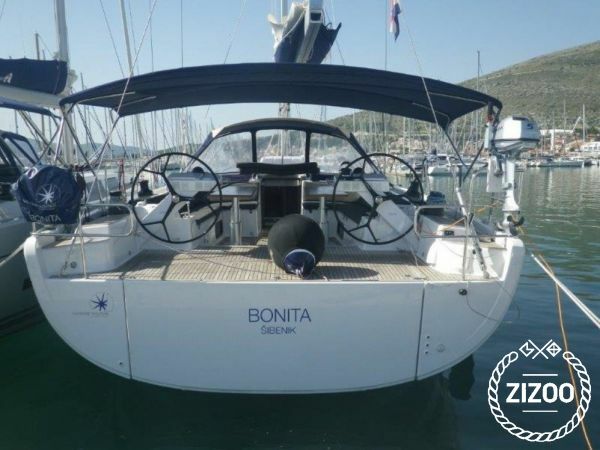 In Spanish and Portuguese, Bonita means 'pretty' and 'cute', but this 2014 Hanse 575 is so much more than that. With 6 cabins and 4 bathrooms, this elegant boat is made for sailing with a large group of your very best friends. Based in Trogir, Bonita comes with a comfortable salon and well-equipped kitchen, along with high-quality gear that promises smooth sailing. Take the Bonita for a holiday on the Adriatic Sea and spend your days under the quiet sun and clear-blue skies. Anchor in one of the many hidden coves that can be found in the region and kickback with a glass of Dalmatian wine and a good book. Snack on olives and figs from the region or treat yourself to a night of good seafood at one of the many local restaurants. Your trip in Croatia would not be complete without visiting some of the most picturesque towns that paint the coast and tell stories thousands of years old. And for any information you may need or any questions you'd like answered contact your friendly crew, always at your disposal. ausgezeichneter support bei technischem problem mit bugstrahlruder.haben uns nie allein gefuehlt. Alles gut, wir kommen gerne wieder. die uebegabderjacht fand sehrspaet statt. aber in anbetracht der sauberkeit irgendwie erstaendlich. thanks staff youre doing a hell of a good job!